This is one of the time in which receving a prize doesn’t make me happy. 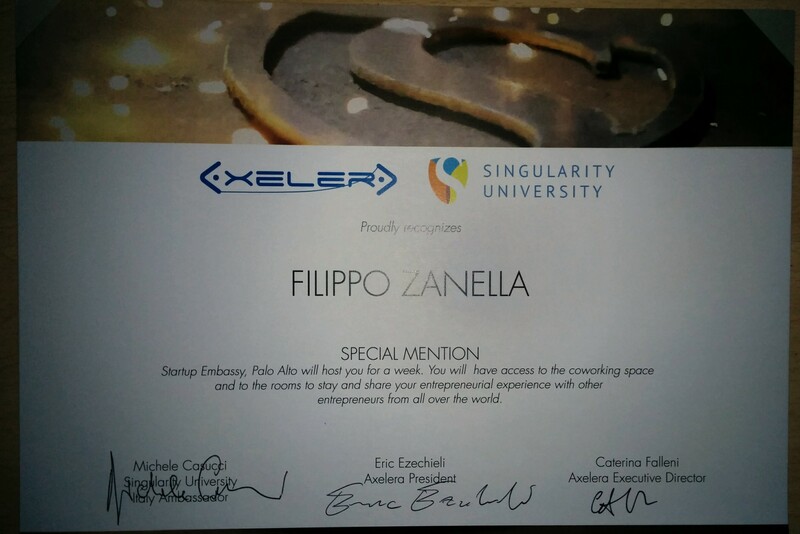 The Axelera association, the Italian promoter of the Singularity University, gave me a special mention within the Global Impact Competition. It was a though competition. I had to pass some interviews speaking directly with people of the board of Axelera and I had to present my global project both via a classical powerpoint presentation and via a 3 minutes video in which I had to briefly describe the details of my disruptive project. I’m sad for two reasons. The first one is that I truly and deeply wanted to win the competition, since the winner would have the opportunity to attend the Singularity University in August. I was sixteen years old when I read “The age of spiritual machines” of Raymond Kurzweil and I was immediately fascinated by this scientist and its ideas. Probably at that time I was one of the fewest Italian that knew him. But this wasn’t enough to convince the judges. The second reason was the fact that I really believed in my project. I think that in the near future the problem of food contamination will be exploited, meaning that every person in its house will be able to know exactly the ingredients of the food it buys. This is very important in my opinion in a world that is more and more globalized and polluted, in a world in which allergies and intolerances are increasing. I missed the first place for a blink of an eye despite my heartfelt commitment. So here I am, leaving the loss behind but sharing with you the video in which I describe my project BYTE.